Seems so idealistic doesn’t it? The rise of ‘Smart home’ technology has moved beyond just asking ‘Alexa’ to turn on the lights. Technology is rapidly advancing to meet the audience demand for personalization, voice integration and connected experiences. Amazon was highly aware of this and made a deal with big American homebuilder Lennar to build ‘Alexa-enabled smart homes’. Sure, asking Alexa to show me recipes with ingredients that are in my fridge is helpful in a way. One off our colleagues at MARE also advocated that having a smart device is handy in a lot of ways. “We ask her to set the timer, so our son knows exactly when to stop gaming or with stupid things like boiling an egg”. 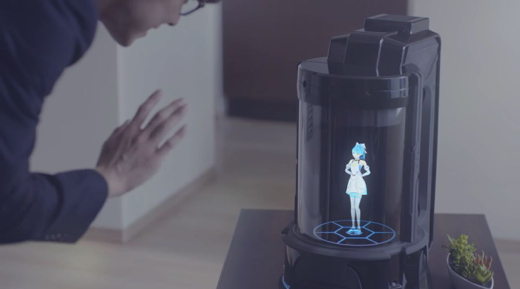 Japan took the Amazon’s Alexa one step further with an artificial intelligent hologram character who lives inside a Gatebox device. Her name is Azuma Hikari. She takes the experience to a whole new level. Azuma is able to interact with you on a personal level and can control your home devices at the same time. She can be your new best friend who will always be there to welcome you home. Doesn’t that sound nice…? A new study shows that every minute of physical activity helps our health. Every little walk to switch off a light, television or thermostat is indeed helpful. With the wave of new technology that is guaranteed to come at us, we need to keep asking critical questions about the possible effects of it all. Otherwise we maybe end up with a world looking like one in Wall-E.